Yue Yi (乐毅) was a capable general for the State of Yan (燕国) during the Warring States Period (475–221 B.C. ), and was considered a master of both the pen and the sword. During his time, the State of Qi (齐国) was very powerful and had a vast territory, but the Duke of Qi was a ruthless ruler who often looted the neighbouring states. 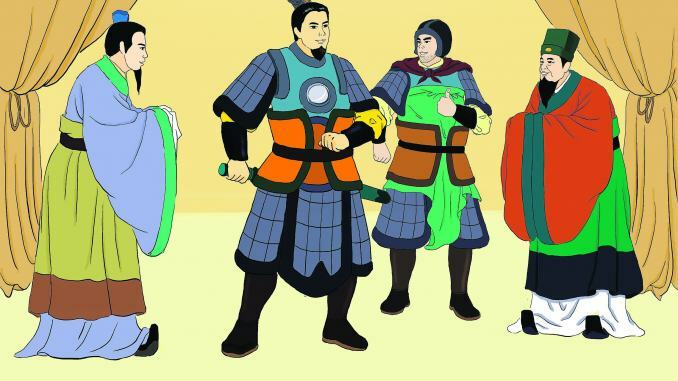 Using his political and diplomatic skills, Yue Yi helped the Duke of Yan establish an alliance with ﬁve other states—the Zhao, Chu, Han, Wei, and Qin—against the State of Qi. He was appointed the supreme commander and led the joint forces of the six uniﬁed states to attack Qi. The military operation was so successful that within six months, some 70 cities in the Qi state were conquered. Afterward, all of the troops of the alliance except Yan’s returned to their own states. Yue Yi stayed in Qi to continue leading the war against the two remaining strongholds. However, after three years of battle, Yue Yi was still unsuccessful in conquering the remaining two cities. Moreover, someone tried to convince the Duke of Yan that Yue Yi was intentionally prolonging his stay in Qi so that he could gain support from the local people and eventually establish himself as the ruler of Qi. The Duke of Yan responded, “Yue Yi’s achievements and contributions are magnificent beyond compare.” He then sent word to Yue Yi that he would award him the title of King of Qi. With much gratefulness, however, Yue Yi declined the honour. After the Duke of Yan passed away, his son succeeded him as Duke Hui of Yan (燕惠王). Knowing about the conflict between the new duke and Yue Yi, the Qi general Tian Dan (田单), seized the opportunity to start the rumour again. The young Duke of Yan, who was already suspicious of Yue Yi, immediately replaced him with another general and ordered Yue Yi to return to Yan. Aware of the duke’s hostile stance toward him, Yue Yi fled to the West and sought shelter in the State of Zhao. Tian Dan later defeated the troops led by the new Yan general and recovered the 70 cities previously lost to the alliance army, thus destroying all of Yue Yi’s previous efforts and victories. The new Duke of Yan regretted replacing Yue Yi, but he also resented Yue Yi for seeking refuge in the State of Zhao and feared that the Duke of Zhao might request Yue Yi to lead a military attack against Yan. So the young duke sent a letter to Yue Yi, in which he acknowledged his own fault for being misled by his advisers, but he also reproached Yue Yi for not honouring his promised service to the former Duke of Yan. Yue Yi expressed that although he had been wronged by the young Duke of Yan, he would not seek redress as he did not wish to damage the reputation of the young duke or his father. In a moving letter of response to the young duke, Yue Yi explained that only with the support and trust of their ruler can talented and competent individuals make great contributions to the state. He expressed his deep loyalty, gratitude, and respect toward the previous duke. He also shared his frustration and regret over the unsuccessful military operation due to the interference from the young duke. However, he did not return to Yan because he feared he would be charged with violating the law and sentenced to death under false accusations by the duke’s advisers. Yue Yi further expressed his belief in tolerance. Although he had been wronged by the young duke, he would not seek redress, as he did not wish to damage the reputation of the young duke or his father. “I have heard that gentlemen will not speak ill of one another despite ending their friendship. And when a loyal official leaves his country, he will not seek to clear his name. Although I am not eloquent, I endeavour to follow this code for gentlemen,” Yue Yi wrote. For the rest of his life, Yue Yi was true to his word. He did not harbour resentment or seek revenge. On the contrary, he tirelessly worked toward building good relations between the states of Yan and Zhao. Yue Yi’s sincere and earnest reply to the Duke of Yan was to become a famous letter in Chinese history. Yue Yi is highly respected by later generations as one of China’s greatest generals because of his loyalty to his monarch, his humanity toward all people, and his wisdom, diplomacy, and military talent. Additional reporting by Cindy Chan.